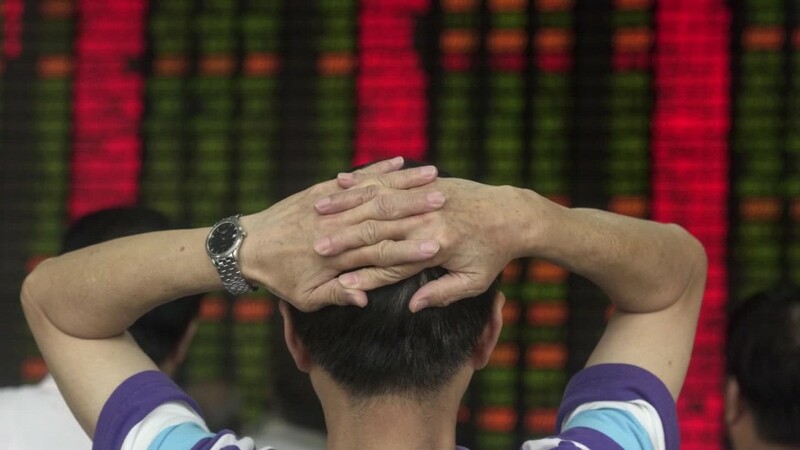 Global stock markets tumbled Monday as worries over China's economy and instability in the Middle East combined to spook investors. The pain was most acute in China, where trading was halted prematurely after weak manufacturing data sent shares plummeting. The benchmark Shanghai Composite shed 6.9%, while the Shenzhen Composite lost more than 8%. The trading halt was China's first-ever use of circuit breakers -- a kind of emergency brake -- on main exchanges. Elsewhere in Asia, Tokyo's Nikkei 225 closed down 3.1% while the Hang Seng shed 2.7%. Crude prices, meanwhile, were volatile on Monday after Saudi Arabia severed diplomatic ties with Iran. Both Iran and Saudi Arabia are major oil-producing countries, and founding members of OPEC. In Europe, markets edged lower in early trading. Germany's Dax dropped 4.3%, while France's CAC 40 declined 2.7% and London's FTSE 100 shed 2.4%. China is a major buyer of European goods, and trouble in the world's second-largest economy put a damper on the first trading session of 2016. "I didn't see that coming!" said Kit Juckes, a strategist at Societe Generale. "A dreadful start to the New Year for global market sentiment has seen circuit-breakers in action in the Chinese equity market and high-beta currencies falling across the board." In China, investors were reacting to data that showed tough conditions in the country's all-important factory sector. After improving for two months, a survey conducted by Chinese media group Caixin showed that PMI fell to 48.2 in December from 48.6 the previous month. Any number below 50 represents a deceleration in the factory sector. While the government's official manufacturing gauge presented a rosier picture, it is heavily weighted toward large enterprises. The Caixin survey taps a smaller sample size and places greater emphasis on smaller firms. But economists said the new manufacturing data, while disappointing, does not indicate that China is facing a severe or unexpected economic slowdown. "While today's unofficial manufacturing PMI hints at some further weakness in the manufacturing sector, other indicators suggest that the economy as a whole held up reasonably well last month," analysts at Capital Economics said. The country's new stock circuit breakers were announced by regulators in December. Starting Monday, a 5% rise or fall on the CSI 300 Index, which tracks stocks in Shanghai and Shenzhen, triggers a 15 minute trading halt. A move of 7% at any time, or 5% in the 15 minutes before markets close, stops trading for the rest of the day. Circuit breakers are already used on major markets in the U.S. and elsewhere.